For three quarters of a century the building, which now houses the Administration of the President of Ukraine, has witnessed almost everything – the Soviet leaders, the Nazi occupation and the vicissitudes of the state independence. These walls, however, have never seen some real life, ordinary people and the flow of history. It looks like the atmosphere of Stalin’s neoclassicism has branded these rooms with some terrible days of Ukrainian history, which like a curse were hanging over any power that came here. More than a year ago, Ukrainians finally said out loud that those days ended forever. We are building a new country now and confidently march into Europe. The Soviet cobwebs should be thoroughly swept out of all the dark corners! Second Floor Art Center relates to widely open doors and windows through which the modern world has entered the building in the form of aspirations and thoughts of ordinary Ukrainians. The main topics of the exhibitions in the Second Floor Art Center relate to significant events, ordinary people and national heroes, descendants’ legacy and achievements of the contemporaries. 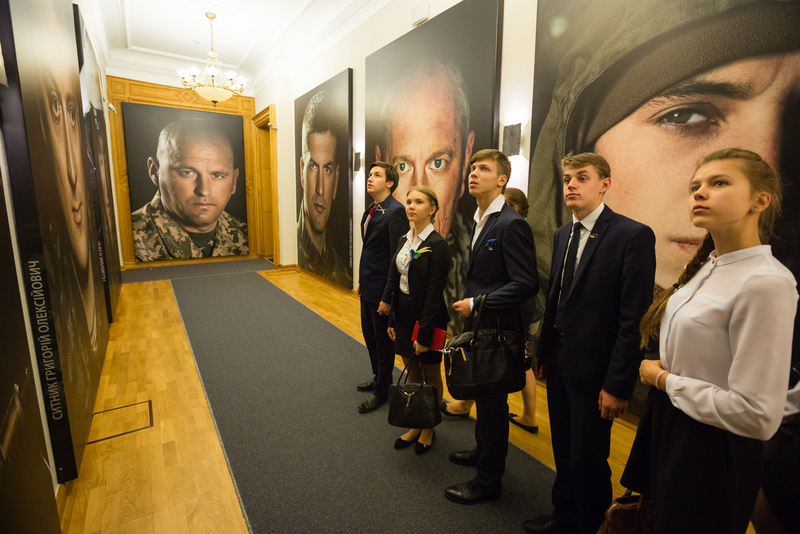 The Administration of the President of Ukraine hospitably opens its doors for the citizens to personally see how the state office works and make sure that changes have finally entered these walls. Ukraine Crisis Media Center (UCMC) was set up in March 2014 to provide the international community with objective information about events in Ukraine and threats to national security, particularly in the military, political, economic, energy and humanitarian sectors. UCMC provides 24/7 media support to all those covering events in Ukraine and runs a daily schedule of live press briefings and moderated discussions to provide the world with accurate and up-to-date information about the fast changing situation in Ukraine. Since its inception, UCMC has evolved into a communications hub with an active outreach to both internal audiences as well as to opinion leaders and the media outside of Ukraine. Ukraine Crisis Media Center has initiated and held over 1,400 press briefings, with 3,000+ speakers, among whom were the leading government officials, diplomats, experts and civic activists and opinion leaders. More than 200 original materials for the Ukrainian and international media were developed and distributed. Over 5,800 representatives of Ukrainian and international media visited the UCMC, 5,000+ journalists have been receiving press releases from the Center. 17,000+ queries from the media were handled by hotline operators. Over 50 fixers worked with foreign media in the regions of Ukraine. Pictoric is a proactive community of Ukrainian graphic designers, illustrators and artists, distinct by their singular vision and unique artistic style, whose works are reflecting, anyhow, current trends in graphic arts. Pictoric Club views its mission as the promotion and development of quality artworks, and precisely of illustrations, able to represent Ukraine internationally. Pictoric organizes annually international illustration exhibitions within the framework of Book Arsenal Festival. Other activities organized by Pictoric over the year are public lectures, exhibition events, workshops delivered by recognized Ukrainian and foreign illustrators. Pictoric participates in the “Lviv – city of literature” UNESCO project, as well as in international book, illustration and design festivals. Pavlo Hudimov’s Ya Gallery Art Center was opened in Podil in Kyiv on April 12, 2007 and in Dnipropetrovsk in 2010 with support of collector Pavlo Martynov. The Art Center’s main goal is consistent support, development and popularization of contemporary art and creating conditions for developing Ukrainian culture. Ya Gallery organizes about 150 different projects yearly – both in Ukraine and abroad, holds educational activities and actively and cooperates with art and cultural institutions, developing their own research areas. Authors of the Ya Gallery are both alive classics of Ukrainian art and young artists, whose works have been awarded with the National Prize. Art Center’s main mission is achieving a high level of social susceptibility and tolerance towards contemporary art.